DAN'S VINTAGE GIJOE INFOSITE - "HAPPY BIRTHDAY G I JOE"
"TIME TO ESTABLISH A BIRTHDATE FOR G I JOE"
HAPPY 51ST BIRTHDAY G. I. JOE ! A few fellow collectors and I got together last year in the L.A. area. 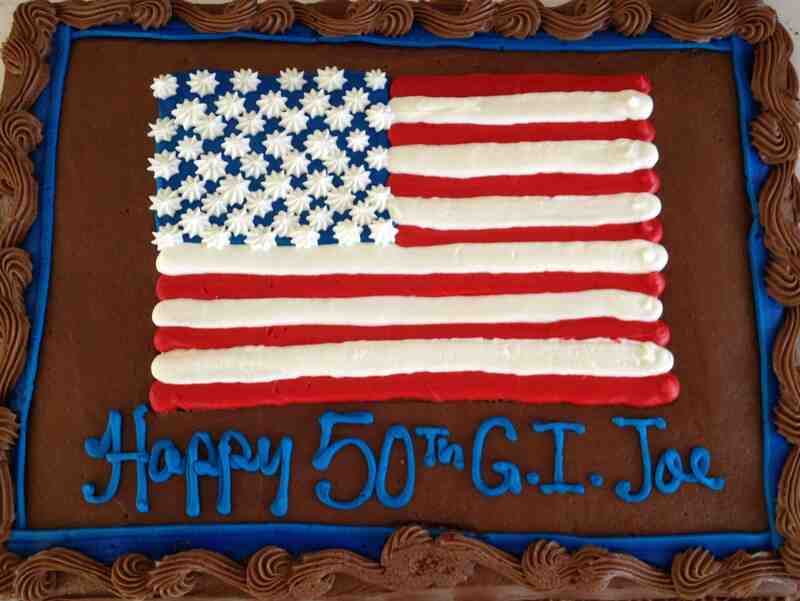 We took a moment to honor the 50th birthday of GIJoe and I had this cake decorated for the occasion. There has never been an official birth date announced for our old action figure friend G. I. Joe. I would like to propose that February 9, 1964 be considered as his birthday, making him 51 years old in 2015. Most people acknowledge that G. I. Joe came out in 1964 because that is when he started showing up on the toy store shelves. I propose the February 9th date because that was the official opening of the 1964 Toy Fair, the Toy Industry show where companies introduce their latest products. At this show, G. I. Joe was was introduced to the world and that is kind of like the day he was born. The Toy Fair starting date can be confirmed by looking up old online newspaper articles. I am assuming that Hasbro did have their display ready for the toy buyers on time but I have not found any articles to confirm this. Still, this date of February 9, 1964 seems as solid a date to say GIJoe was born since he was introduced widely to the world. The old Masterpiece Edition book from 1996 talks about this time frame and will confirm that the first molded GIJoe figures made for the big Toy Fair display were molded just days before the show. It talks about everything was a big rush and of course a big secret project. Other sources might hint at GIJoe first being molded in 1963 which is entirely possible but for the sake of the general population of all the vintage GIJoe figures still in existence, let's just call 2-9-64 as Joe's birthday. It is also a curious date to remember since this was also the date that The Beatles were introduced in America; on February 9, 1964 the Beatles played live on the Ed Sullivan show for the first time. The day the Beatles came to the U.S. is remembered fondly by many people still alive today. It was a turning point in music history and of course the "British Invasion" dates back to this time as well. It is hard to believe that we have known GIJoe for 51 years and maybe even harder to believe that we have been listening to Beatles music for that long too.